Cyanobacteria, or blue-green algae are single-celled organisms that naturally exist in fresh or salt waters. They use sunlight to make their food. When there are a lot of nutrients available in the water, the bacteria can grow rapidly or “bloom” to form a visible film or scum on the surface of the water. This is more likely to occur in warm spring and hot summer months, however, unseasonably warm temperatures in fall and winter can produce blooms. Cyanobacterial blooms are often green or blue-green in color although they can sometimes be red or brown. They’re common organisms found in lakes, rivers, and ponds (freshwater), as well as estuaries (brackish water). What causes blue-green algae blooms? Inadequate water flow or exchange of water when tides change. Changes in rivers and their surroundings due to land clearing, farming practices, construction and housing. What effects do blue-green algae blooms have on humans? Most species are not toxic, but some blue-green algae can produce neurotoxins (nerve) toxins or hepatotoxins (liver) during blooms that may be harmful to humans. People maybe exposed to these toxins in three ways: swallowing water, direct skin contact, and breathing aerosolized bacterial toxins that are in the air. When in doubt, stay out! If water containing blue-green bacterial toxin or cell components is swallowed, gastrointestinal symptoms such as stomach pain, nausea, vomiting, and diarrhea can result. If direct contact is made, skin and eye irritation can result, with symptoms such as tingling or numbness of the lips, fingers and toes and dizziness. Respiratory irritation can result from breathing air that contains toxins or cell components. Long-term exposure to blue-green bacterial toxins may result in liver damage. Effects due to HAB nerve toxins may appear within 15-20 minutes of exposure while liver toxin symptoms may take hours or several days to appear following exposure. If you are concerned that you have been exposed to a harmful algal bloom, please see your doctor or contact your local health department. Telling your doctor about contact with water may help him/her treat the illness properly. Public access points where blooms have been known to occur may be posted with educational awareness signs such as this. 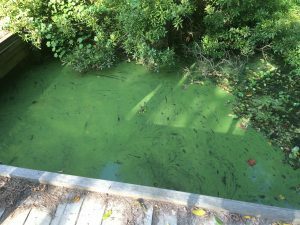 What effects do blue-green algae blooms have on animals and fish? Mammals and birds can get sick and die from drinking water with a blue-green bacterial bloom. Decaying bacterial blooms will deplete the dissolved oxygen in the water and fish may die as a result. Dense bacterial blooms floating on the surface will also block out sunlight that is needed for other organisms to survive. Some bacterial bloom toxins are directly harmful to fish and can cause fish kills. Pets are also prone to exposure and due to their small size and a small amount of toxin can cause illness if ingested. Do not allow pets to drink untreated water and if a bloom is present in a waterbody do not allow them to swim. Wash your pet’s coat thoroughly with fresh water after recreating in natural waterbodies. If animals are exposed to HAB toxins, symptoms may include weakness or lethargy, staggering, difficulty breathing, and convulsions. While there have been no confirmed pet deaths in association with HABs, they have been reported in neighboring states. If you believe your pet was exposed to a HAB contact your veterinarian. 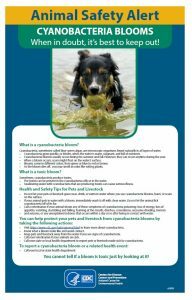 It will be helpful to detail your pets contact with the water so that he/she may provide proper treatment. Livestock deaths have also been reported nationally as a result of HAB exposure. When in doubt, keep pets and livestock out! Is it safe to eat seafood from waters with blue-green algae blooms? Internal organs (innards) of fish and crabs caught in bloom waters may be poisonous and therefore, should not be consumed. Eat fish that appear healthy and that have been caught in waters where there are no known water advisories. Carefully clean fish, discarding all guts and the carcass, thoroughly cook the fish fillet, and wash hands and surfaces with fresh, soapy water afterward. How do I protect myself from the effects of blue-green bacteria? Observe signage indicating a harmful algal bloom is present and avoid contact with the water. Avoid direct contact with water that has unusual color or where blue-green bacteria have been identified, even if the water appears to be clear. This means no swimming, wading, paddling, diving, or water-skiing in affected waters. If direct contact has been made with water containing blue-green bacteria, wash off with fresh water. In some cases, skin irritation will appear after prolonged exposure. If symptoms persist, consult your local health care provider or your local health department. Never drink untreated water. Do not drink water from an area where blue-green bacteria have been identified even if it has been treated; boiling the water will not destroy these toxins. Do not let children, pets, or livestock get into or drink affected waters. If they do, wash them thoroughly wish fresh water. Animals tend to lick their fur after they get wet – it’s important to wash them down very well. People that are prone to respiratory allergies or asthma should avoid areas with bacterial blooms. Do not eat internal organs or use the carcass for stock of fish caught in bacteria-infested waters. If you have cleaned fish fillets caught from affected waters, thoroughly wash any of your skin that has come into contact with the fish, in addition to surfaces during cleaning and preparation. Do not wash dishes with water where a blue-green bacterial bloom has occurred. If washing dishes with untreated water cannot be avoided, rinse dishes with fresh or bottled water. Use rubber gloves if contact with affected waters must be made. What is Virginia doing about blue-green bacteria? 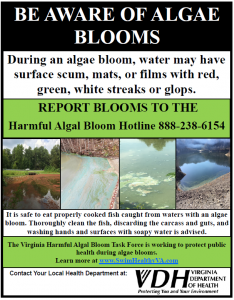 The Virginia Department of Environmental Quality (DEQ)and the Virginia Department of Health, including the Division of Shellfish Sanitation, Division of Environmental Epidemiology, and the Office of Drinking Water, in addition to other state, federal and local agencies, work together to regularly monitor the water and shellfish growing areas for the presence of blue-green bacterial blooms and their toxins, and to conduct surveillance for human health effects. This group is known as the Virginia Harmful Algal Bloom Task Force. The public will be notified via the media if a blue-green bacterial bloom that could affect human health is identified. The Algal Bloom map will also be regularly updated from March – November to reflect the status of waterways experiencing a bloom. How does the HAB Task Force respond to blue-green algae blooms? Bloom investigations begin with site visits and assessment of whether a bloom is present. 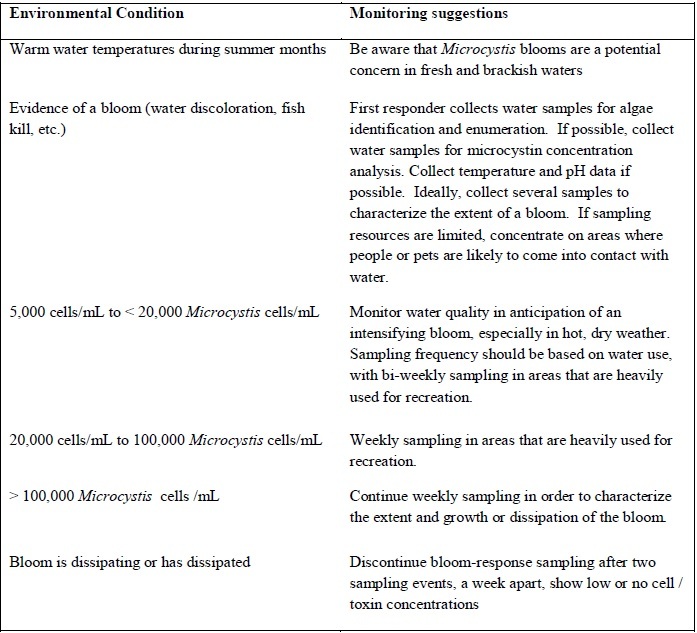 If a bloom is suspected samples are collected and transferred for analysis for taxonomic identification and enumeration. If HAB species are present, toxin analyses may be done based on those which the species is capable of producing. 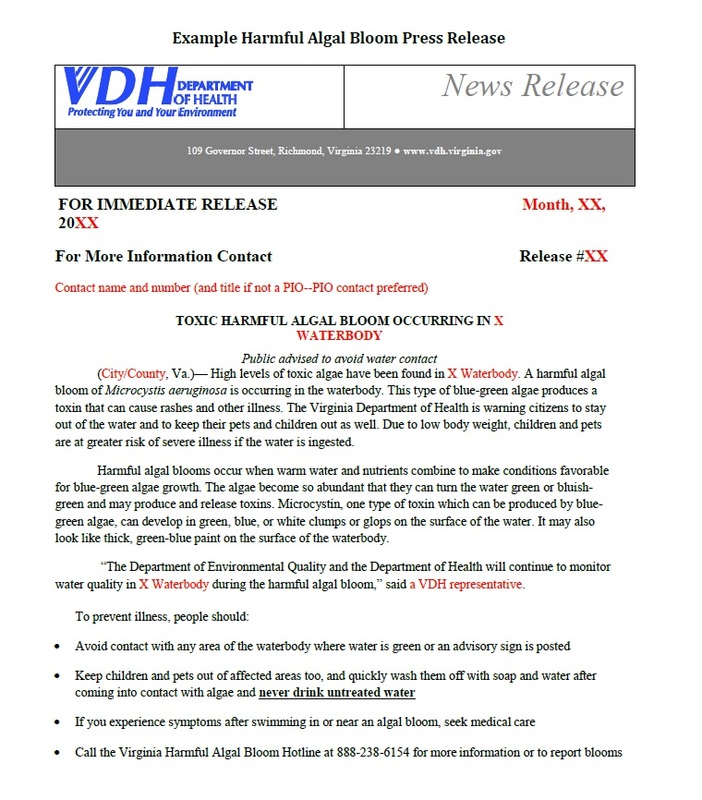 The local health district is notified of the bloom and guidance is given with respect to the results of the investigation and potential for human exposure. Depending on the location of the bloom and the uses of the water – whether the water is used for recreational purposes or if it is a drinking water source – additional samples and analyses may be necessary. For recreational advisories, the VDH Division of Environmental Epidemiology will utilize the three tiered approach detailed in the Recreational Guidance for Microcystin and Microcystis Blooms . This guidance will be updated and revised as necessary to reflect national recommendations as they become available. What are the nationally recommended advisory thresholds for HAB toxins in drinking water? 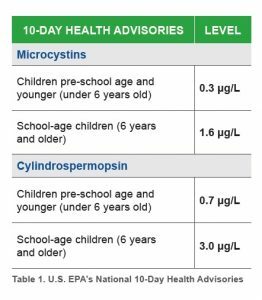 EPA issued advisory thresholds in 2015 for two cyanobacteria toxins in finished drinking water – microcystin and cylindrospermpopsin. The 10-day health advisories may be applied at levels protective for two population groups; (1) infants and children younger than six years old and (2) adults and children six years and older. For more information visit the EPA links below. What kind of signage is used to indicate when a HAB has been detected in a waterbody? The Health Department will use the “Attention” sign to indicate that harmful algae are present at the second tier of the recreational advisory guidance (20,000-100,000cells/ml). At this level, the HAB Task Force initiates weekly monitoring and the local health department is advised to issue a public notification to advise people on the bloom and to limit exposure of themselves and pets to areas affected by the bloom. The Health Department will use the “Warning” sign to indicate that a harmful algae bloom is present at the third tier of the recreational advisory guidance (>100,000cells/ml) which are levels capable of producing toxins harmful to human health, or has observed microcystin concentrations >6ug/L, or has observed alagal scums or mats. At this level, the HAB Task Force initiates or continues weekly monitoring and the local health department is advised to issue a public notification to avoid all contact with the waterbody affected by the bloom. What does a public notification of a HAB include? 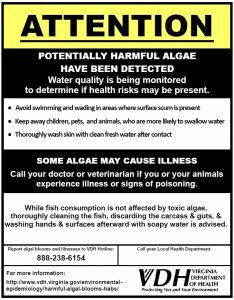 A harmful algal bloom public notice will include the entity issuing the public notification, the location and extent of the bloom and results of HAB Task Force investigations to include identification and concentration of the species in addition to results of toxin testing. Website links and contacts for additional information about the bloom will be provided. Typically, a feature webpage of the investigation will be accessible either through the main HABs website or in the area below the Algal Bloom map. Examples of both are typically kept current on these pages for reference. How does someone report an algae bloom? 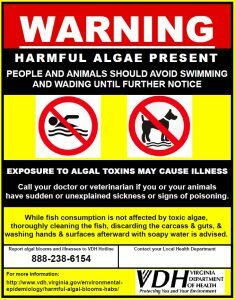 If you are concerned that you have been exposed to a harmful algal bloom, please see your doctor or call your local health department. Telling your doctor about contact with water may help him/her treat the illness properly. For information on federal policy and guidance, please visit the EPA CyanoHAB website and the CDC HAB-Associated Illness website.